Under the new Great Bear Rainforest land-use order, ecological integrity is achieved through increasing the amount of protected old-growth forest to 70 percent from 50 percent. As well, eight new special forest management areas covering almost 295,000 hectares will be off-limits to logging. Six may receive additional protection based on ongoing discussions with First Nations. With the new measures, 85 percent of the forest will be protected and 15 percent will be available for logging, supporting local jobs. Under this agreement, the commercial grizzly bear hunt will cease in Coastal First Nations’ traditional territories. 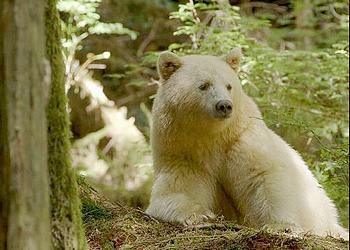 White Kermode bears, often called “spirit bears,” live in the Great Bear Rainforest. White or cream-colored coats occur in about one-tenth of this subspecies of the American black bear, due to a double recessive gene unique to the subspecies, Ursus americanus kermodei. Fewer than 400 Kermode bears are estimated to exist in the coastal area that stretches from southeast Alaska south to the northern tip of Vancouver Island. 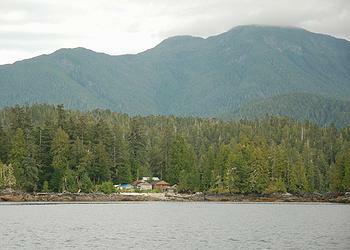 The Great Bear Rainforest was established through land-use decisions announced in 2006. This globally unique area covers 6.4 million hectares on British Columbia’s north and central coast, and is home to 26 distinct First Nations. The province has signed reconciliation protocols with the Coastal First Nations and Nanwakolas Council. Through these government-to-government relationships, separate human well-being agreements have been reached to address issues of special concern to each group of First Nations. In addition, the province has committed to amending atmospheric benefit-sharing agreements with Nanwakolas and Coastal First Nations, increasing the forest carbon credits they can use to support implementation of ecosystem-based management and community development projects. 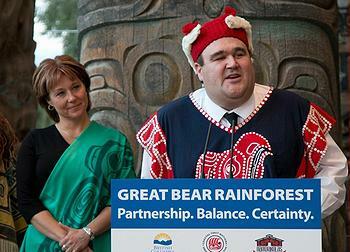 “The Great Bear Rainforest is now a landscape of hope. It is a landscape where economic activity will again begin to align with nature’s limits,” said Wieting. Because of the uniqueness of the Great Bear Rainforest and the innovative elements in the new and amended agreements, the British Columbia government intends to introduce supporting legislation this spring. The land-use order addresses First Nations’ cultural heritage resources, freshwater ecosystems and wildlife habitat. The amount of habitat protected for the marbled murrelet, northern goshawk, grizzly bear, mountain goat and tailed frog will increase as new reserves required by the order are developed. Chief Marilyn Slett, president, Coastal First Nations, said, “The Great Bear Rainforest – a global ecological treasure – has been home to our communities on the Central and North Coast and Haida Gwaii for more than 10,000 years.